"Wine Mic Monday" is a VAULT29 series based on an "open mic concept" where wineries take over our blog...because every glass and bottle of wine has a story. This week we are proud to feature Laetitia Vineyard & Winery. The passion behind the brand is displayed by their premium estate wines showcasing the distinctive qualities of the Arroyo Grande Valley. Located in Southern San Luis Obispo County (SLO), their beautiful costal property overlooks the Pacific Ocean. VAULT29: How did the winery get started? Nadia: Laetitia Vineyard & Winery was originally planted in 1982 by Champagne Deutz from France, recognizing it was the perfect location to create Methode Champenoise sparkling wines in California. Contrary to so many French houses that settled in Napa or Sonoma, Maison Deutz settled on the Central Coast close to San Luis Obispo to plant Pinot Noir, Chardonnay and Pinot Blanc for our sparkling wine program. We still use Pinot Blanc in small quantities as we really like its unique textural quality that softens and imparts creaminess to our bubbles. VAULT29: What's the origin of the winery name? Nadia: In the mid 1990s the winery changed hands and was named Laetitia after that owner's daughter. When we bought the winery in 1998, we liked the name very much and decided to keep it. In 2005, we were looking to name our wines from the Santa Barbara Highlands Vineyard; we named it NADIA after me, the current owner's daughter. We appreciated the synergy between the two names, and I very much liked the fact that both our brands names end in IA, it's very pretty and poetic, and feels quite fitting. At times it's been confusing to hear people discussing NADIA the wine and not me the person but I've become more comfortable with it as time has passed. I'm also quite proud that I've been able to leverage the tagline on the NADIA cork, "You never know wher life will take you," into our present campaign that shows me, Nadia the person, promoting NADIA wine all over the country and world. VAULT29: Tell us a bit about the people behind the brand. Nadia: Without sounding biased, the team at Laetitia is absolutely brilliant. My father, Selim Zilkha, who at 87 is as vital, smart, sensitive, curious and innovative as a businessman as he ever was, is someone who really cares for the wellbeing of his emplyees as well as the growth of our brands. He even went on Facebook in 2004, but by 2008 he'd had enough! I think we can all understand his feelings about that! Eric Hickey, our talented winemaker, grew up at Laetitia alongside his father Dave Hickey, who makes our sparkling wines, and couldn't have a better understanding of how to perfect the product due to a lifetime around the vines, grapes and wines. Lino Bozzano our visionary vineyard manager has implemented many great practices to improve our vines. 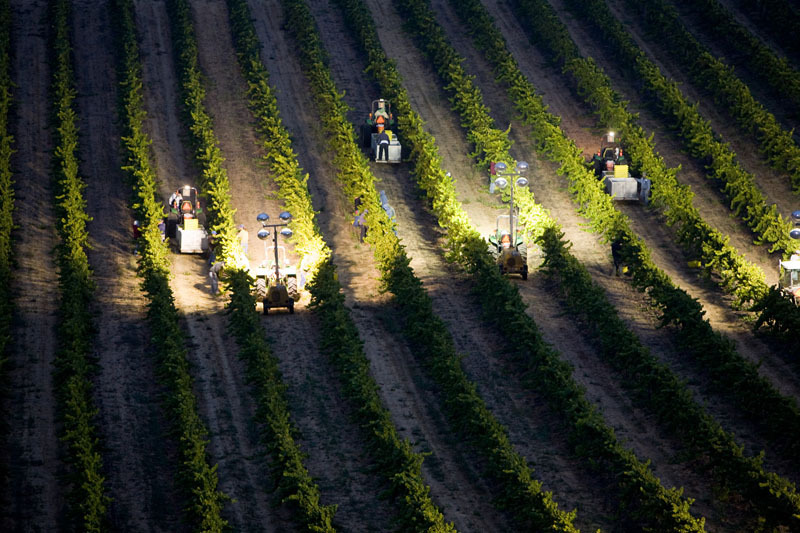 These include night harvesting, Sustainable-in-Practice (SIP) certification to ensure we care about the land for the future generations, using goats for weed abatement and new types of trellising to maximize sun protection at our Santa Barbara Highlands Vineyard. VAULT29: Why did you choose the region and/or varietals? Nadia: As I mentioned earlier, the French recognized the potential for planting Burgundian varietals on our rocky volcanic limestone soils that benefit from being in the cool Region III climate. (At Laetitia, we’re only three miles away from the ocean and the maritime fog layer sits on our land keeping it cool all morning long during the summer). Our other vineyard at Santa Barbara Highlands is at 3,200 feet in elevation, inland and is very mountainous, making it better suited to Bordeaux varietals with its hot days and cold nights. The hearty Cabernet Sauvignon and Sauvignon Blanc grapes there are able to withstand and thrive in the Region III climate and the short and intense growing season. We’ve really matched soil to varietal to create wines that ring true, showcasing our commitment to the region we love that’s been so good to our brand. VAULT29: What can wine lovers expect to experience when visiting? Nadia: When I think about Laetitia I'm proud of our family owned and family estate run vineyard. We have melded our international roots and sensibilities to very American soils. The landscape is beautiful: gentle rolling hills with larger unobstructed vineyards. Our tasting room is friendly right off the 101 Freeway on the way to San Luis Obispo, a three-hour drive from Los Angeles, making it very convenient to visit. We have many interesting wines to taste there beyond our 8 core broad market wines. We make 8 different Pinot Noirs for the Tasting Room. My favorite is the Whole Cluster Pinot Noir, sold exclusively there. We have 8 different wine clubs to choose from including a sparkling club. So we offer a great deal of variety partly because of our size but also because we really enjoy showcasing the many clones and wine making possibilities our estate has to offer. VAULT29: What does owning and working in a family business mean to you? Nadia: In our family it's a tradition that sons automatically work with their fathers; I feel so blessed that for the past 15 years my father has enabled and encouraged me to work directly with him. More recently, I've become the family face for our brands. 2015 marks our 17th year in the wine business and it's been a remarkable journey. We make delicious wines that are true to the terrior and pair beautifully with all kinds of food. This is particularly important to us. After all what's better than wine with food or food with wine? VAULT29: Plan to attend any wine events locally or nationally? If so, where and when? Nadia: One event that I'm especially excited for us to be attending is a Laetitia/NADIA dinner at the James Beard House in New York City on Saturday April 25th. Eric, Lino and I will all be there talking about our wine. Chef Chris Manning from Thomas Hill Organics in Paso Roble will be cooking. He's already familiar with our wines having cooked at the Laetitia Estate House last November. It was a faboulous pairing all round and I have no doubt this will be as phenomenal as the last one! "Like" Laetitia Vineyards & Winery on Facebook, "Follow" them on Twitter, Pinterest & Instagram. Be sure to add your Laetitia experiences in the VAULT29 app!